This morning in Huntington at 7:20AM it’s currently 48 degrees under clear skies. Winds are calm. Relative humidity is 98%, dewpoint 48, barometric pressure 30.23″. Yesterday’s high was 76, and the overnight low was 48. High pressure is firmly entrenched across the northeastern US, and will continue to serve up delightful weather straight through the weekend with clear skies and above normal temperatures. We’ll see sunny skies today with highs in the upper 70s and light and variable winds. Tonight should be clear with lows in the mid 50s and light and variable winds. Sunday should be sunny with highs in the upper 70s to 80 (some records may be broken!) with light and variable winds. Sunday night should be mostly clear with lows in the mid 50s and light and variable winds. Monday’s looking partly sunny with highs around 70 and light and variable winds. Monday night should be mostly cloudy with lows in the upper 40s. Last year on this date we had a high of 65 and a low of 44. The Moon is a waxing crescent, 3d 5h old with 10% illumination. 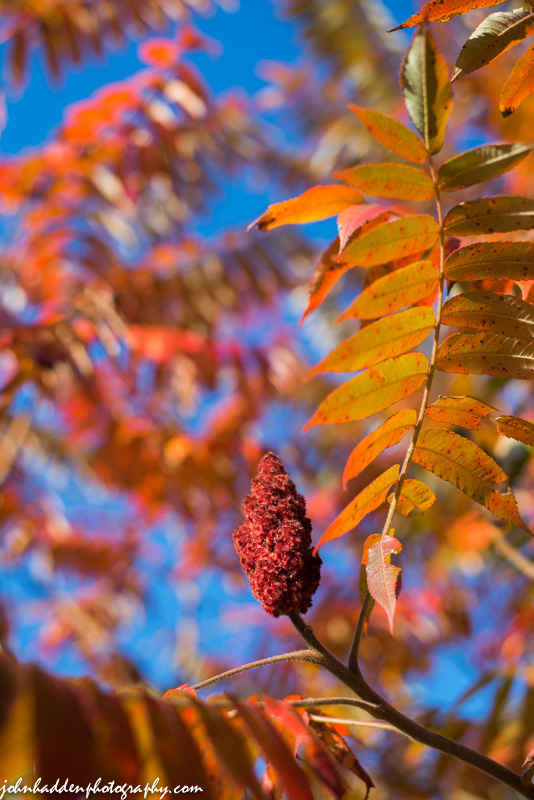 Gotta love the vibrancy staghorn sumac this time of year. It’s often one of the first to pop into its fall colors. Nikon D600, Nikon 50mm lens, ISO 125, f/2.8, 1/2000″ exposure. This morning in Huntington at 6:45AM it’s currently 45 degrees under clear skies. Winds are calm. Relative humidity is 98%, dewpoint 45, barometric pressure 30.27”. Yesterday’s high was 70, and the overnight low was 45. A large high pressure system will become established over the northeastern US and persist right through the weekend bringing dry, sunny conditions and temperatures above seasonal norms. We’ll see sunny skies with highs in the mid 70s today with light and variable winds. Tonight should be clear with lows in the lower 50s and light and variable winds. Saturday should be sunny with highs in the mid 70s and light and variable winds. Saturday night should be clear with lows in the mid 50s and light and variable winds. Sunday’s looking sunny and warmer with highs in the upper 70s and light and variable winds. Sunday night should be partly cloudy with lows in the lower 50s. Last year on this date we had a high of 61 and a low of 35. The Moon is a waxing crescent, 2s 4h old with 5% illumination. 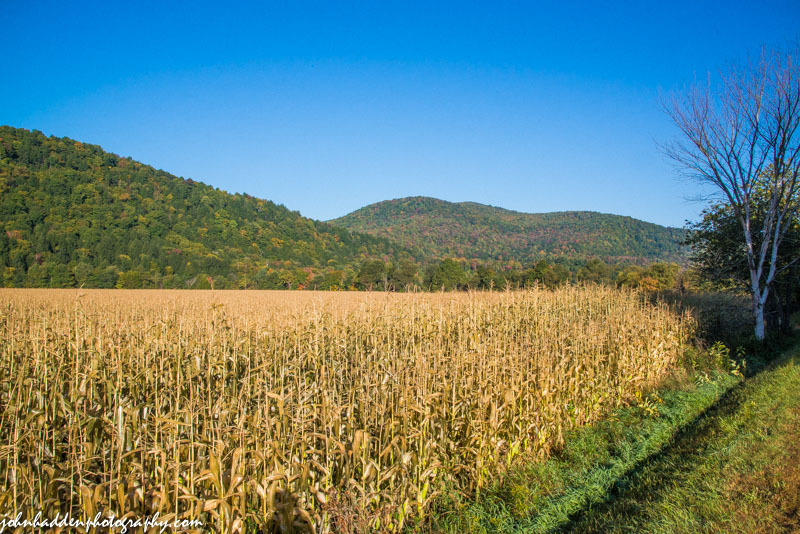 The cornfields along the Main Road near the Alpaca Farm are just about ready for chopping, and the fall colors are coming in quickly to the hillsides across the Huntington River. Nikon D600, Nikon 24-120mm lens @ 24mm, ISO 800, f/18, 1/400″ exposure. This morning in Huntington at 7:00AM it’s currently 45 degrees under partly cloudy skies. Winds are calm. Relative humidity is 98%, dewpoint 45, barometric pressure 30.47″. Yesterday’s high was 70, and the overnight low was 44. A low pressure system will be moving up the eastern Seaboard today spreading high level clouds into the region, but we shouldn’t see any precipitation out of it. We’ll see mostly sunny skies with highs in the upper 60s and light and variable winds. Tonight should be clear with lows around 50 and light and variable winds. High pressure will again build in Friday brining sunny skies and above normal temperatures with highs in the lower 70s and light and variable winds. Friday night should be clear with lows in the lower 50s and light and variable winds. Saturday’s looking sunny and warm with Highs in the mid 70s and light and variable winds. Saturday night should be clear with lows in the lower 50s and highs in the upper 70s. At this point it looks like we’re in for an extended period of great fall weather heading clear through most of next week! Last year on this date we had a high of 62 and a low of 38. 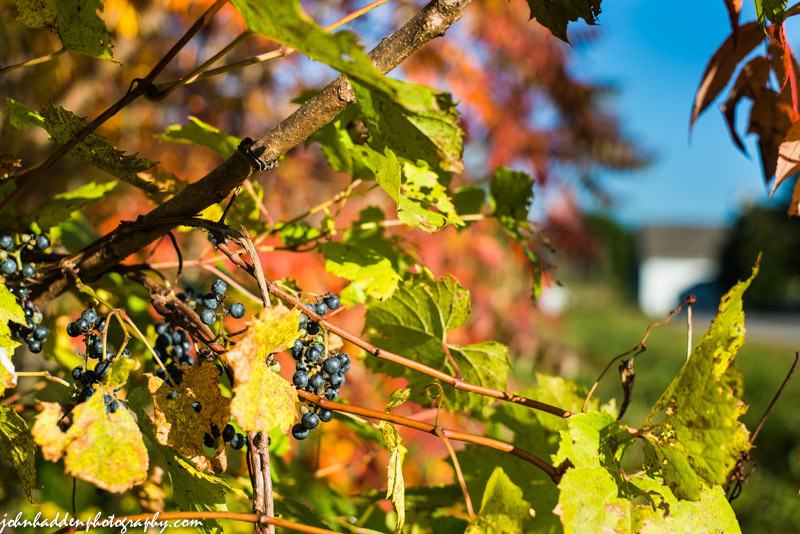 I came across these wild grapes climbing the fiery red sumac along the Main Road near the Jubilee Farm barn (in the background) yesterday morning. They were a tad on the sour side! Nikon D600, Nikon 50mm lens, ISO 125, f/3.5, 1/800″ exposure. This morning in Huntington at 6:55AM it’s currently 42 degrees under clear skies. Winds are calm. Relative humidity is 98%, dewpoint 41, barometric pressure 30.55” and rising rapidly. Yesterday’s high was 63, and the overnight low was 41. With a large area of high pressure anchored over New England, we’ll see fair and dry weather and above average temperatures clear through the upcoming weekend. We’ll see sunny skies today with highs in the upper 60s and light and variable winds. Tonight should be clear with lows in the mid 40s and light and variable winds. Thursday should be partly sunny with highs in the upper 60s and light and variable winds. Thursday night should be clear with lows in the upper 40s and light and variable winds. Friday’s looking sunny with highs in the lower 70s and light and variable winds. Friday night should be clear with lows in the lower 50s. Last year on this date we had a high of 60 and a low of 41. 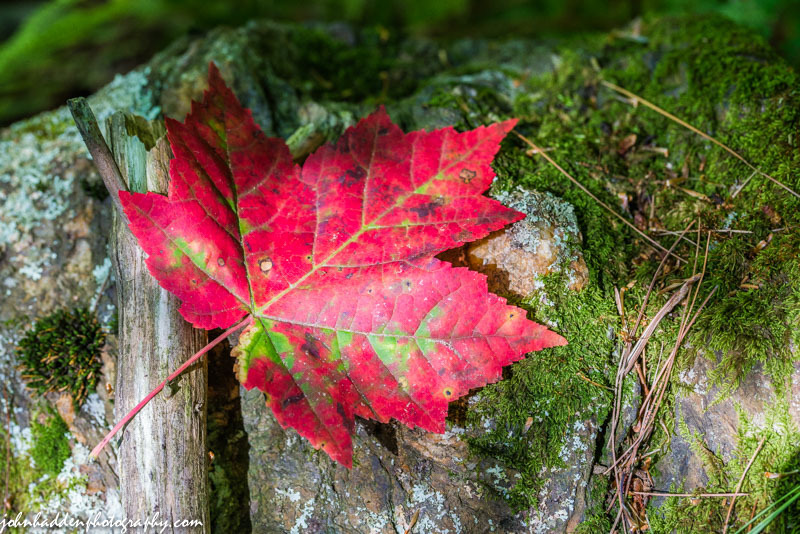 As the colors begin to shift into high gear, I came across the solitary bright red sugar maple leaf up in the wood on mossy rock. Nikon D600, Sigma 105mm macro lens, ISO 1250, f/8, 1/320″ exposure. This morning in Huntington at 6:45AM it’s currently 44 degrees under overcast skies. Winds are calm. Relative humidity is 98%, dewpoint 44, barometric pressure 30.20” and rising. Yesterday’s high was 62, and the overnight low was 39. An upper level trough across Quebec and northern New England will bring variable amounts of cloudiness across the region today with a few sprinkles possible across the mountains. We’ll see mostly cloudy skies with highs around 60 and light and variable winds becoming westerly around 10 mph this afternoon. Skies will clear out tonight as broad high pressure amplifies over the eastern US. Overnight lows will be in the lower 40s with light and variable winds. Wednesday should be sunny and milder with highs in the upper 60s and light and variable winds. Wednesday night should be clear with lows in the mid 40s and light and variable winds. Thursday’s looking sunny with highs in the upper 60s and light and variable winds. Thursday night should be clear with lows in the upper 40s. Last year on this date we had a high of 49 and a low of 42. We picked up 0.11″ of rain. Burlington norms for this date are highs of 67 and lows of 48. The Moon is a waning crescent, 28d 20h old with 1% illumination. 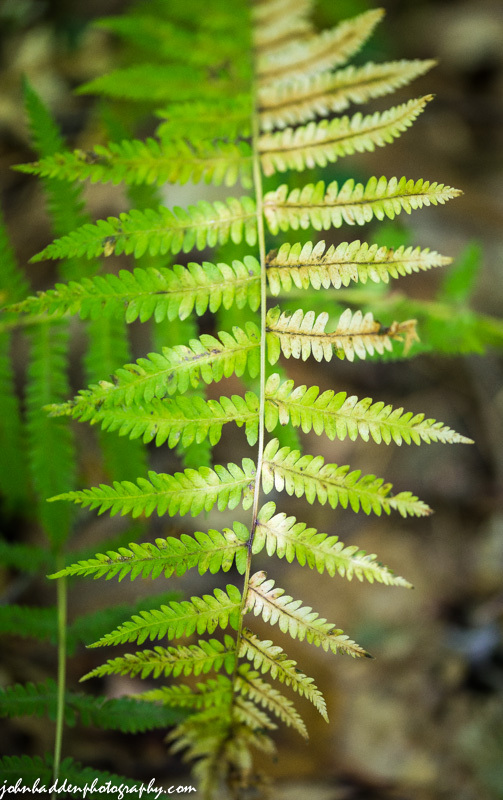 The wood ferns are fading up in the woods across the road. I love the way the take on a bright lemon-lime color as they fade to white. Nikon D600, Sigma 105mm macro lens, ISO 800, f/3.5, 1/60″ exposure. This morning in Huntington at 6:30AM it’s currently 56 degrees under overcast skies. Winds are calm. Relative humidity is 96%, dewpoint 55, barometric pressure 29.58” and rising. We picked up 0.34” of rain overnight. Yesterday’s high was a summery 81, and the overnight low was 56. The surface cold front which brought showers to the region overnight will shift east of the region today and andy scattered showers should taper off this morning. We’ll see mostly cloudy skies with a chance of showers this morning. It’ll be on the cool side again with highs only in the mid 50s and west winds 10 to 15 mph gusting up to 30 mph. Chance of rain is 50%. High pressure will begin moving in tonight bringing partly cloudy skies with lows in the upper 30s and west winds 10 to 15 mph. Tuesday should be partly sunny with highs in the lower 60s and southwest winds around 10 mph, becoming westerly in the afternoon. Tuesday night should be mostly clear with lows in the lower 40s and north winds around 10 mph. Wednesday’s looking sunny with highs in the mid 60s and light and variable winds. Wednesday night should be clear with lows in the mid 40s. At this point the trend is for gradually warmer and continued dry weather into next weekend. Last year on this date we had a high of 62 and a low of 45. We picked up 0.67″ of rain. Burlington norms for this date are highs of 68 and lows of 48. The Moon is a waning crescent, 27d 20h old with 3% illumination. The Autumnal Equinox occurs today at 10:29PM. Equinoxes, like solstices, occur twice a year—in March and September—and mark the time when the the earth’s axis (tilted at 23.5°) is near perpendicular with the sun’s rays as the earth orbits the sun. Consequently, we get a near-equal amount of night and day. You can read more about the equinox here. Astute observers (John I…) will note that the length of day reported above is not exactly 12 hours. This is because of two things: the first is that “sunrise” is defined as the moment that the leading edge of the sun first breaks an imaginary plane of the horizon, and “sunset” is the moment the upper edge of the sun disappears below the horizon. It takes some time for the entirety of the sun’s disc to travel below the horizon, hence more daylight. Also, refraction causes the sun’s upper edge to be visible from Earth several minutes before the edge actually reaches the horizon, and, conversely, after it sets. I hope that explains it! You can read more about it here. Robin & I biked the Richmond River Trail along the Winooski River yesterday morning. 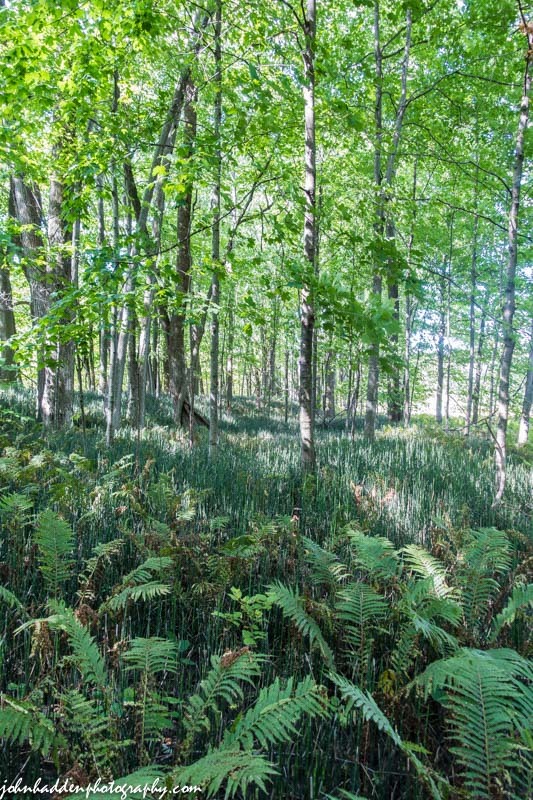 We came across this enchanting horsetail forest down near the mouth of the Huntington River. Lovely! Sony RX100m3, ISO 125, 1/30″ exposure. Frosted white asters in the front field yesterday morning. This morning in Huntington at 7:50AM it’s currently a balmy 54 degrees under overcast skies. Wind are out of the southwest at 3-5 mph. Relative humidity is 82%, dewpoint 49, barometric pressure 30.19” and falling. Yesterday’s high was 59, and the overnight low was 38. High pressure departing off the New England coast will bring mild, dry and gusty conditions to the region today. We’ll see mostly cloudy skies this morning, then partly sunny skies later in the day. Highs will be in the upper 60s with south winds 15 to 20 mph gusting up to 35 mph. Tonight should be partly cloudy and mild with lows in the upper 50s and south winds 10 to 15 mph gusting up to 30 mph. Sunday should start out partly sunny with a chance of showers in the morning, then become mostly cloudy with showers likely and a slight chance of thunderstorms in the afternoon as a cold front and associated low pressure move in. Highs will be in the lower 70s with south winds 10 to 15 mph. Chance of rain is 70%. Sunday night should bring occasional showers. Lows will be in the mid 50s with south winds around 10 mph. Chance of rain is 90%. Showers will linger into Monday with mostly cloudy skies and highs in the mid 50s with northwest winds around 10 mph. Chance of rain is 50%. Monday night should be partly cloudy with lows in the lower 40s. Last year on this date we had a high of 79 and a low of 45. Burlington norms for this date are highs of 69 and lows of 49. The Moon is a waning crescent, 25d 21h old with 12% illumination. 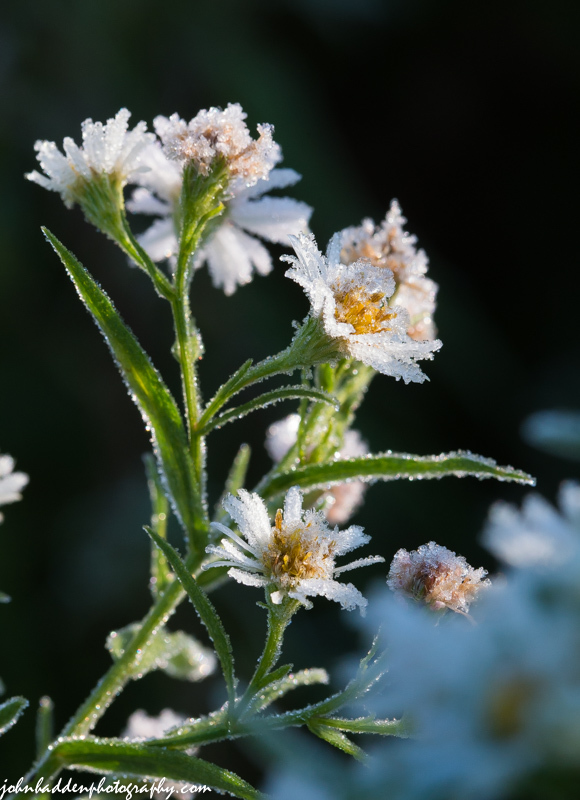 Yesterday’s frost lay thick and heavy on the flat-topped white asters in our front field. They appear almost glass-like in the morning sun.